I work as a teacher in one of the private schools for girls. My dream was to study at the university after finishing high school, but my husband was an obstacle to this dream, so, I decided to teach in a primary school Now, I have four children, nevertheless my dream to complete my education never left my mind. Protests had begun and the revolution had started in 2011, then we were forced to flee the town after being bombed several times. In 2013, all the inhabitants left to different areas, when the situation became quieter, we came back to the town. Unfortunately, this tranquility did not last, on the contrary the situation worsened and the fighting between the factions and the regime became fierce. We were forced into the last displacement when the regime proceeded to occupy the town in 2014. I will never forget that day. The real suffering had begun when we left our house and square where we lived our childhood and youth, and where our children lived. We left our houses, belongings, our memories, and every beautiful thing in our life, we left our home where we lived the most beautiful days in our life. I couldn’t accept the new life in a house that was not mine and a town other than my town, but the worst thing is the absence of my family and siblings, all of them are outside of Eastern Ghouta. After all of that, I did not have more than one month in Hazza when my eldest son was killed, which broke my heart and everything became black in my eyes. I decided not to be weak and to continue my life and go back to school, so I taught for a year in the girls school and in the second year I was a mentor in another school with a private institution, while the siege became more difficult, we suffered a lot from the high prices, roads being blocked and a lack of fuel, and so we were forced to cook using the wood fire. We were patiently waiting for this situation to end for two years until things started to improve, that was with making tunnels reaching to Damascus, I could go out twice and I was very happy to see my daughter and brothers. I spent one month and a half, it was a relief for me, although my dream was to see my detained brother who we lost four years ago. I got back to Ghouta then the area entered into a new period of siege with food shortage and lack of goods to buy from the markets. Women in Ghouta suffer bitterly where they live in these harsh conditions of shelling and bombs on the one hand and the difficulty of life on the other, and not to provide the necessities for their children like the most important staples such as bread and milk. But women tried to overcome the siege, showing their strength and persistence in the face of challenges, women can provide bread, water, washing and cooking, as well as working outside the home. 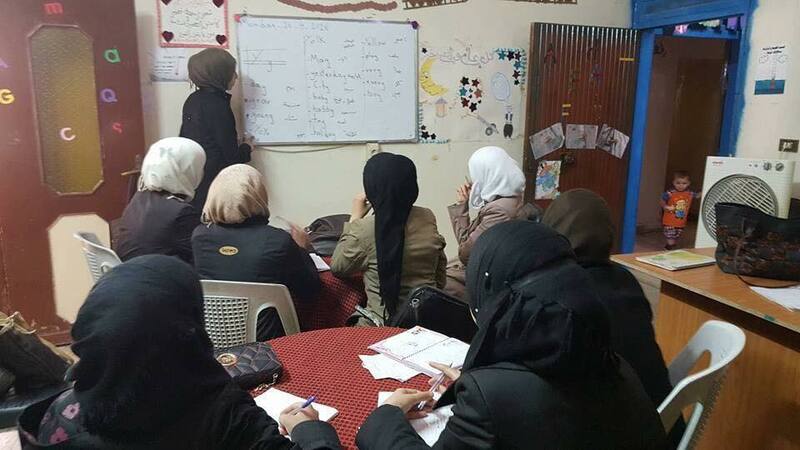 Women in Ghouta did not neglect their interest in other aspects such as learning sewing, computer and language in centers providing assistance, awareness and skills training. What made the situation worse, is the rivalry of military factions and their control of the markets and monopoly for some materials. In addition to the traders’ greed and their monopoly over goods and their profane profits. Thank God anyway I am happy with my work, as I like to work with kids, I feel that the children need someone who understands and psychologically supports them with encouraging words.